Hello! You MIGHT have noticed that we haven’t updated in over a week. You MAY be slobbering for our quality content. If so, that’s totally fine and nothing to be ashamed of. Truthfully, speaking as our own biggest fans, we are also pining away for new content, but it just ain’t happening. Sorry! Previously, we have mentioned that we take “unexpected vacations” away from this site, and that normally it is for “mental health reasons,” let’s say. 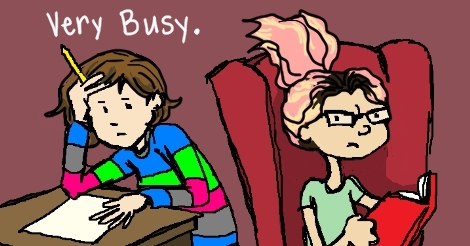 And other times, we are just actually busy. Well, this time we are both VERY busy. Ridiculously busy. Stressfully busy but actually so busy that we can’t even take Weep Days in order to cope. I have an actual deadline for an actual paying project that is due October 10th, and Dollissa is about to go to Florida for two weeks for a mandatory work event, and then a little extra time for Florida fam that she doesn’t get to see often enough. I imagine that all of that is going to take up a lot of her time and energy, and my project is definitely going to take up all of my creative energies, and the subject of the work is so emotionally draining that I will probably need a few days to gather myself before I can be okay again. So, please fill up your meantime with pushes of our Random Sneer button, a TarotScope when Tonyana delivers, and keep an eye out for our glorious return to normalcy just in time for our Halloweeks Celebration!